The Dayton Area Chamber of Commerce will continue to serve the business community and promote business friendly policy decisions at the local, state and federal levels of government. The chamber’s legislative agenda serves as a guide for the legislative and regulatory priorities that it maintains and helps direct the chamber’s public policy success throughout the biennial session. The chamber commits to our members and the greater Dayton region that we will continue to strive for a business friendly legislative and regulatory environment that encourage businesses growth and economic prosperity. 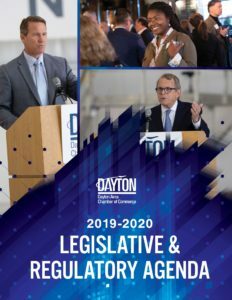 For a complete overview of the chamber’s current legislative priorities, download our 2019-2020 Legislative & Regulatory Agenda (PDF).